Approach is the path one takes to get to a particular building. The approach could be direct or indirect. Once you enter the building you need to navigate your way around it. Circulation determines how a person moves thru the building. The sequence one moves thru the building and the spaces one encounters could completely change the perception of space. 1. Using your examples of your building typology show how you approach the building (path) and how the circulation works in those buildings. Show the entrance(s), vertical circulation, and the main circulation throughout the floor plans. There may be public and private circulation. Space Organization: Buildings are composed of a lot of spaces. Those spaces are usually organized based on their function or use. 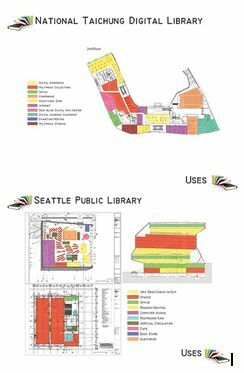 So think of organization of spaces as what is the function of the space and color code. Based on those diagrams you should get a clear understanding on how a particular type of building is organized. Provide a legend that will be used throughout your five examples.